The port city of Lisbon has long enthralled visitors with its charming streets, stunning architecture, beautiful hilltop views, and abundance of culinary and cultural experiences on offer. Here's how to make the most of one day in the Portuguese capital. Whether with a guided walking tour or solo, start today at Belem Tower (Torre de Belém), a UNESCO World Heritage Site dating to the 16th century and one of the city’s most iconic structures. Continue to the nearby Jeronimos Monastery (Mosteiro dos Jerónimos), which, like Belém, is an excellent example of Manueline (Portuguese late Gothic) architecture, and a fascinating place full of impressive art; it also contains Portuguese explorer Vasco da Gama’s tomb. Next, journey to the charming Bairro Alto neighborhood, known for its beautiful cobblestone streets. Take a ride up the Bica Funicular (Elevador da Bica) to St. Roch Church (Igreja de São Roque) before lunch. Hop aboard Tram 28, Lisbon’s most famous tram line with a route that provides great insight into the city. Many travelers use it as a sightseeing tour, grabbing window seats and taking photos along the way, though you can also get off and on again along the route. Seats fill up quickly, so it may be best to board at Martim Moniz and stay on the whole time. Once you’ve made a complete circuit, spend a little time exploring Rossio Square, with its towering Column of Pedro IV. Alternatively, Lisbon’s hop-on hop-off sightseeing bus tour is similarly customizable and convenient. Come evening, travel over to Alfama, the oldest neighborhood in Lisbon. Start by going up to Sao Jorge Castle (Castelo de São Jorge) for great city views; if you arrive after 6pm you’ll have to experience it from the outside. Then head into the neighborhoods below, wandering the hilly streets. Once you’ve worked up an appetite for dinner, stop in one of the area’s many taverns to grab a meal while experiencing a live performance of fado, a Portuguese musical tradition characterized by melancholic lyrical storytelling. Alternatively, enjoy dusk on the water aboard a sunset sailing tour on the Tagus River. Immerse yourself in Lisbon’s heritage during this small-group, full-day tour. 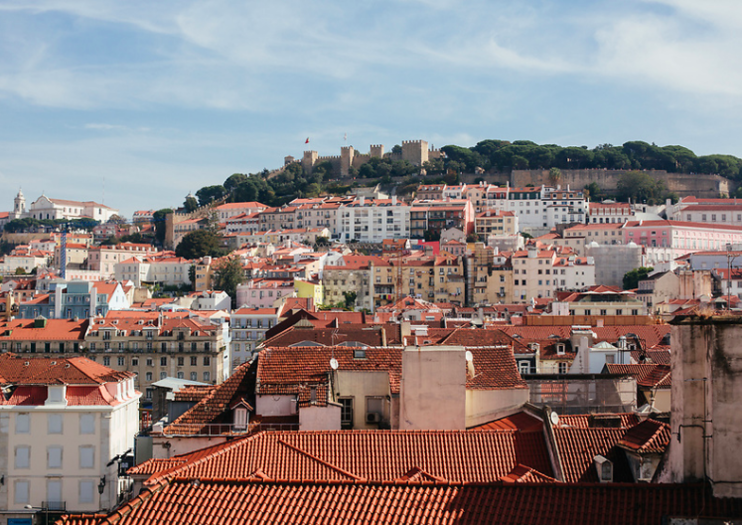 Explore Lisbon’s oldest quarter, Alfama, and learn the history behind the famous monuments and squares from your guide as you go. Pass through the neighborhoods of Bairro Alto, Chiado, and Baixa by minivan, and discover the UNESCO World Heritage Sites of Jerónimos Monastery and Belém Tower.